Abstract: The lure of the flatscreen monitor is a strong one. After growing up with large and bulky Cathode Ray Tubes, the slim flatscreens stick out like candy for the taking. The lure of the flatscreen monitor is a strong one. After growing up with large and bulky Cathode Ray Tubes, the slim flatscreens stick out like candy for the taking. The only drawback is their cost. Flatscreens are usually very expensive, and tend to be a bit beyond budget of the average consumer. 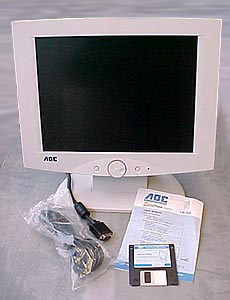 Whereas a decent 19" flatscreen costs as much, or more than the average computer, a 19" CRT can be had for only a few hundred. In this review we'll be looking at a 15" flatscreen display from a company called Envision Peripherals (EPI). The LM-500 is target towards the budget minded consumer with its' relatively low price. Based out of Freemont, the EPI have been making monitors for over 18 years, largely for the reseller market. This probably explains why haven't heard of EPI previously. As we've seen in the past, monitor quality is usually a very polar entity. A good monitor is superb, and bad monitor is really bad. In the world of displays, there just doesn't seem to be any middle ground. Its' either good, or bad. Before we begin lets clear up one thing that we found a bit confusing. Hard Coating (3H), Anti-glare Treatment, 10,000 hour lifespan backlight. To completely configure a system with this monitor, a diskette is included which has the necessary drivers. Windows was smart enough to detect the display type and load supporting drivers by itself without requesting the files on the disk. Drivers can be downloaded from EPI's website at www.epius.com however if they are required. Pg 4. Is it really that great?